The people can get more detailed information about Hippodrome's architecture in the pictures of the priest O. Panvinion (Above). 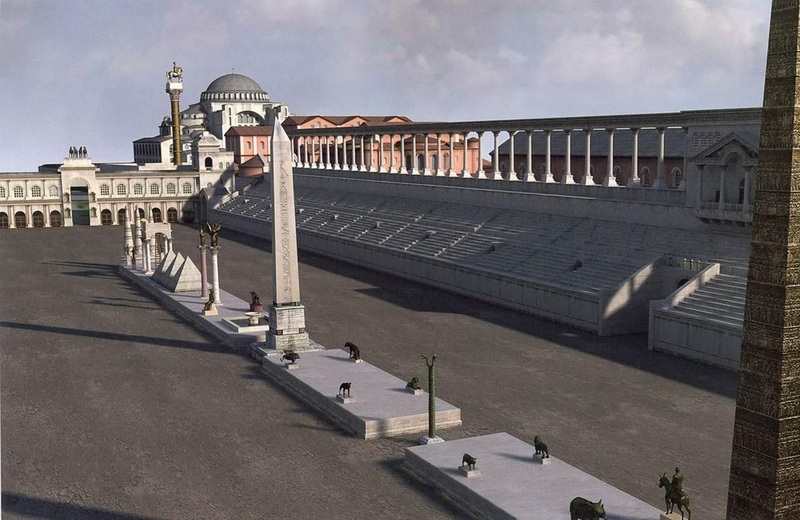 It is also refered lenght and width of Hippodrome with 370 m long and 120 m wide measurements. Hippodrome is originally surrounded by the sitting sets from three sides. So, this sitting sets were composed of 30 to 40 steps and also it is said to have a hundred thousand people capacity. 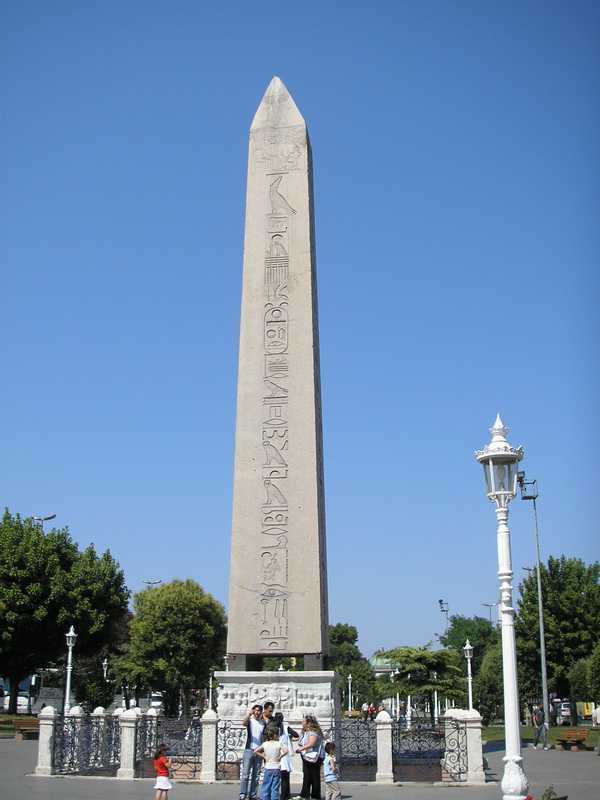 Pretty attractive Thedosius I Obelisk is the product of Egypt. It is 20 m high. Upon this stone erected for the sake of Tutmosis III in B.C1500 was filled with hieroglyph. These hieroglyphical words that cannot be solved by Byzantines have not been found out until 1823. Therefore it was seen as a talisman by them. As the name suggests, once upon a time this snake-shaped column comprised of three headed serpent . 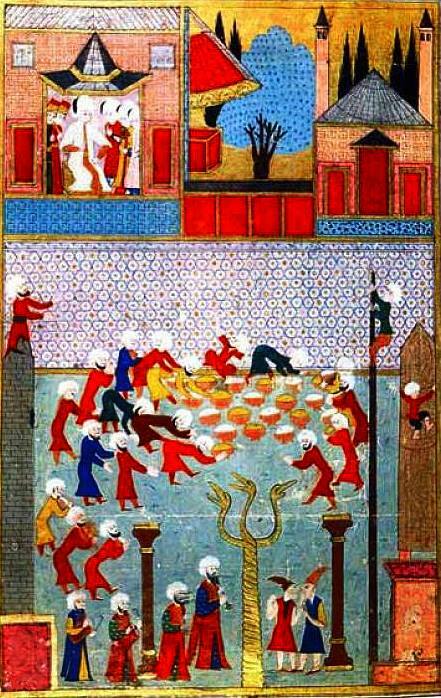 They carried a fume caldron (the product of the ancient era) upon their heads before. This column was brought to İstanbul from Delphi, Greece. 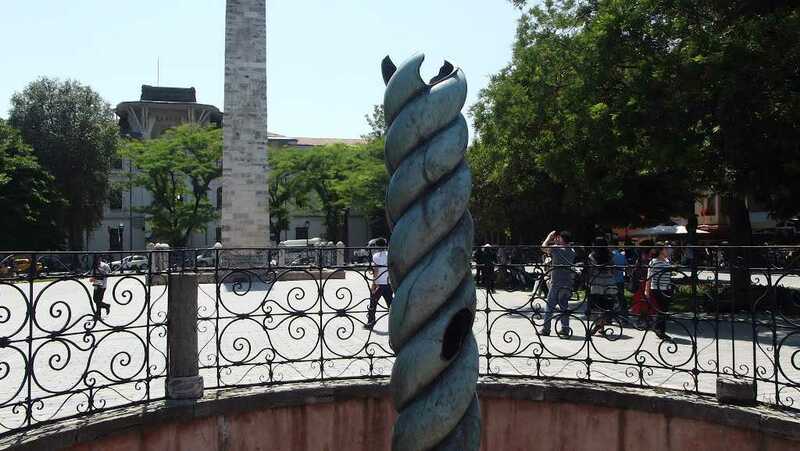 The spiral column was made from melted weapons belonging to the losers as a victory of the war that Greeks won against Persians. After that war, it was given by Greeks as a present to Delphi Apollo Temple in order to show their thankfulness. But then the mythologic three footed cauldron carried by the serpents disappeared. Today nobody knows where they are, how and when three headed serpents were taken .But one of them are kept in the Archaeological Museum in Istanbul. After the conquest of Istanbul, nearly nothing remain behind except for several monuments and a few relics and Kathisma. These relics were used the building construction in order to be rebuilt that historical place. Once upon a time Hippodrome was used as chariot/car races, but then it was a place that was played javelin(national Turkish game) by the public. Because of that was also named as Horse Square. After that ,Horse Square or Hippodrome was surrounded by new building in Ottoman period such as Ibrahim Pasha Palace (slayed Sadrazamn of Suleiman the Magnificent),famous Blue Mosque built by Ahmet I, fascinating Hagia Sophia bath(the product of the great architecture Sinan) and Fıruz Aga Mosque(the treasurer of Sultan Bayezid II). That fascinating Hippodrome has also witnessed many feasts, marriage ceremonies like the proverbial marriage of Sultan Hatice and Ibrahim Pasha and the circumcision feasts of sultan’s son. Today it is a crowded place that many tourists visit and many programmes are showed. 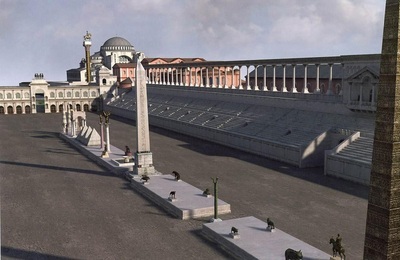 A type of small Palace called Kathisma was located at the north part of Hippodrome (Location of Today's German Fountain) with construction built on 24 columns. This small palace had the public room, the dining hall and the special compartment belonging to the guardians. Whenever Emperors were exposed to the stone rain or face public strikes, they were escaping to the main palace through private tunnel. Every emperor has contributed to be adorned Hippodrome with marble, bronze and copper statues brought from Rome, Greece, the Aegean Islands. Besides this magnificent statues, the portraits belonging to Perikles(a successful statesman) ,Augustus (the first emperor of Rome), Lusimahos (one of the Alexander the Great's governors) had been found here. But many monuments were destroyed during ‘’1204 Latin Invasion ‘’and ‘’The Crusades’’. In the rest of that, there was no anything else except for bronze horse statues and several other statues. 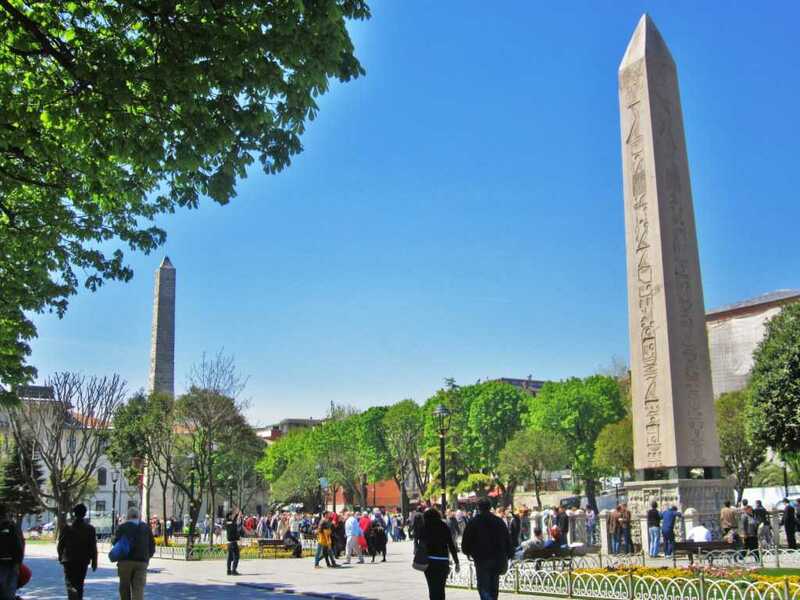 Firstly, Konstantin obelisk had been tried to be erected by Konstantin II but he failed because he died. Secondly, after 30 years the story was repeated; following emperor Thedosius I could not built due to die. Finally, after years Arkadyus (395-408) was successful. 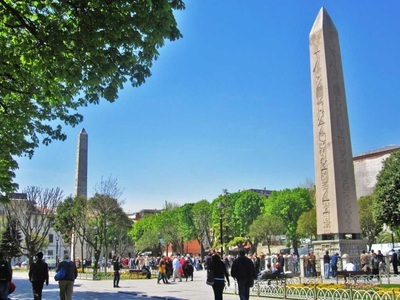 This fascinating obelisk erected by him gives fairly information about Byzantine Plastic Art. It is located in two tablets written in Greek and Latin upon the obelisk. Except for that famous obelisk, there is found another monument named as ’’Kathisma’’. 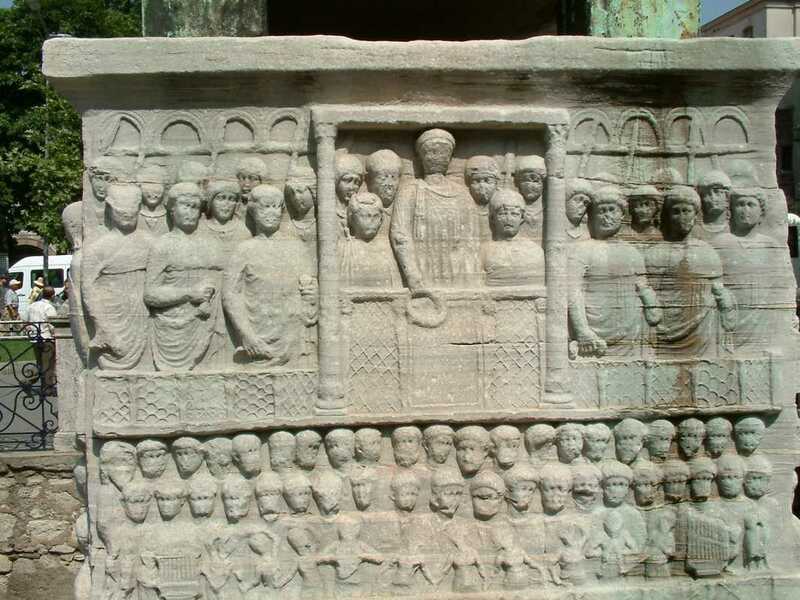 Thedosius I,his wife and his sons Arcadyus, Honarius accompanied by statemen, guardians and the audience were portrayed in Kathisma (Emperor lodge).In addition, the nations defeated by Byzantines, the erection of Obelisk event, chariot/car races, belly dancer, musicians were displayed on this stone. 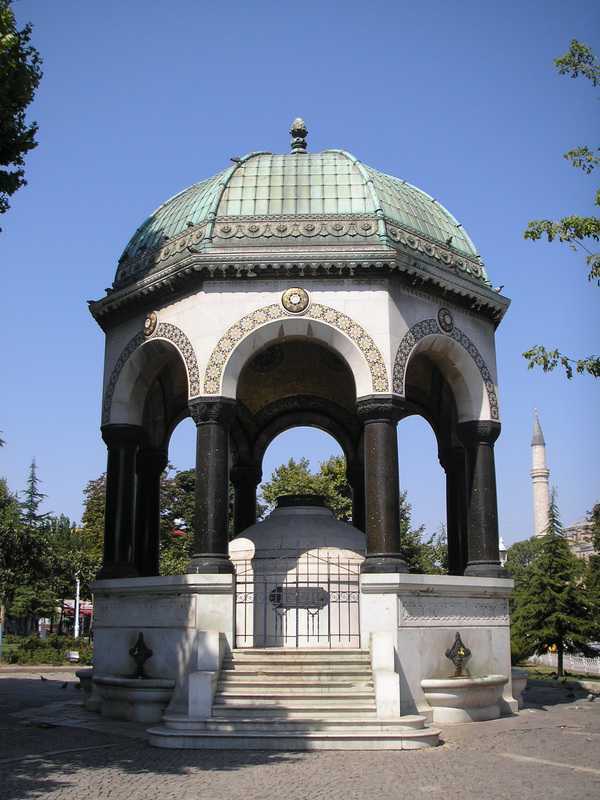 Near the northern end of the Hippodrome, the little gazebo styled fountain can be found with beautiful stonework.German fountain also known as Kaiser Wilhelm’s Fountain.Once German emperor paid a state visit to Sultan Abdül Hamit II in 1901 and presented this fountain to the sultan and his people as a token of friendship. Fountain was originally built in Germany, then transported piece by piece and assembled in its current site in 1900. German fountain's octagonal dome has eight marble columns, and dome's interior is covered with golden mosaics.The monograms in the stonework represents the political union of Abdul Hamit II and Wilhelm II.